This week, I finished #1 on my Finish-A-Long list for quarter 2. This is a graduation quilt for our oldest granddaughter Kyleigh. The project started out as swap blocks from a number of years ago. They consisted of Laurel Burch's line Jungle Songs and black Kona cotton. I decided to add a panel from Laurel Burch's Ocean Songs with a mermaid, and I made a braided border. I ended up making about 13 more blocks than the original swap blocks. To be able to quilt it on my frame, I was not able to add any further borders for the outside. As it was, I had to go back and separately quilt 4 inches on either side that was too long for my frame. I have no clue why when I bought the fabric for this swap I bought so much extra but I was able to use up a lot of it on the back of the quilt. The quilt measures about 91 x 91 inches. 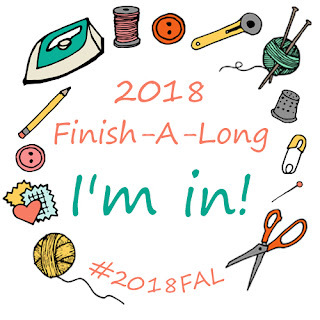 Two more items on my Finish-A-Long list, and I have actually almost finished an item that wasn't on the list, quilting a Wooly Flowers sampler, a UFO from 2007. I had a busy week last week. I finished up Kyleigh's graduation quilt to a flimsy stage. I never did find my 2 blocks, and ended up making 3 more as one of the blocks was too small, and 2 are AWOL. I just got the batting for this quilt, but am going to quilt a couple of others first. This is the finished top. It is about 91 x 91. I also finished Buttermilk Basin's A Tisket-A-Tasket sew along from a couple of weekends ago and it came out really cute I think. I think next up to quilt is this Wooly Flowers Sampler by Starry Pines Pattern Company. It has been finished since 2003, just not quilted. This was not on my original list for the Finish-A-Long, but I feel a need to get started quilting it. It shouldn't take too long. I have been quilting since probably around 1996 or so, and have had a Handiquilter rail set up since the first ones came out. This was before they had a Handiquilter machine, so I use a Juki. All I have basically done on it is meander. I am challenging myself to do something besides meander. I have been watching lots of videos to do something besides meander. So tomorrow I will load this one up, and hopefully my thread won't shred like it usually does. I have bought some Aurofill thread. Well off to think about dinner.